It's Friday, October 10, 2014 and time once again for the Lucky Mojo Curio Company's Facebook Fridays! Giveaway. This week we bring you "Indian Spirit Guide, an old Spiritualist formula. The inclusion of Native American imagery is a hoodoo tradition that seems to date back to the early days of slavery, when Africans first met and admired Indians for their independence and herb lore. Additionally, the historical warrior Black Hawk, who led an insurrection against the White government, has long been revered in the Black Spiritual Church Movement as "The Watcher on the Wall." A protective ancestor, he helps you hold your own in troubled times. This week, SIX lucky winners will gain the benefits of Indian Spirit Guide. Each winner will recieve a seven inch white Pull-Out Candle and a bottle of Lucky Mojo Indian Spirit Guide Dressing Oil to anoint it with. then scroll down, and post a comment to the Facebook Fridays! status message for October 10, 2014. 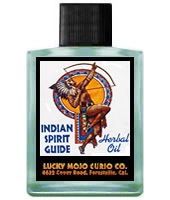 First thing tomorrow morning, we will select SIX winners at random, and ask them to message the Lucky Mojo Curio Company Facebook Page with their mailing addresses, so we can send them their FREE Indian Spirit Guide products. Thanks for posting, Ernie! Now, all you folks, click on over to the Lucky Mojo Facebook page and enter to win! We have a winner! In fact, we have SIX lucky winners! Our Facebook Fridays! winners for October 10, 2014 are: Verna Gates, Santiago Barela, Alana Han, Raleigh Bryant III, Torie Millbrook, Steve Mason.